"Hang onto your hats kiddies, this one's a real shocker..."
After being riffed upon by the likes of Creepshow, Tales from the Darkside, and other assorted 80s anthologies, Tales from the Crypt returned with a vengeance in 1989 courtesy of HBO, who resurrected the old EC Comics title on TV. 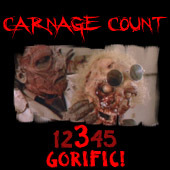 Over the course of seven riotously entertaining seasons, it delivered a multitude of sordid tales and introduced the world to one of the genre’s most unsung icons in The Cryptkeeper, the maniacally cackling animatronic host voiced by John Kassir. And while I’ll always have a soft spot for those other anthologies (I’m looking squarely at you, Freddy’s Nightmares), Tales from the Crypt was absolutely my jam, especially when I joined the legion of 90s kids weaned on late-night HBO and all the inappropriateness that entailed. Those network shows—and for the most part, even Creepshow—were relatively safe and quite quaint compared to the Cryptkeeper’s brand of lurid, explicit horror, delivered directly from that delirious crypt glimpsed each week in the show’s signature title sequence. He peddled such wares right out of the gate, too, as the show’s pilot episode is a mean, nasty little tale. Directed by series producer Walter Hill (one of many heavyweights who ushered Crypt to the screen), “The Man Who Was Death” boasts a charismatically sleazy turn from William Sadler, here playing a prison executioner who revels in his job. His narration—soused in a Deep South drawl—reveals a perverse man who can’t wait to send jolts of fatal electricity through suddenly repentant death row inmates. He soaks it all in each time: the cries of the damned, the violent jerks of their bodies, the smoking husks they leave behind. However, when the state suddenly reverses course and abolishes capital punishment, leaving him to find a purpose in life. To fill the void, he takes up an electrifying form of vigilante justice, scouring news broadcasts and courtrooms to find scumbags skirting justice before frying them straight to hell. A terrific template setter, this debut episode captures the show’s general vibe and aesthetic, particularly its willingness to be twisted as hell. EC Comic’s signature brand of wry, dark humor is on display throughout, particularly in Sadler’s warped performance as a man who is charismatic despite all the red flags (read: casual racism and misogyny) surrounding his character. He’s a maniac, but his magnetic personality is absorbing as he becomes a sort of proto-Jigsaw, rigging up elaborate traps to ensnare corrupt, immoral victims. Hill’s camera doesn’t shy away from the carnage, offering up charred, electrified bodies, practically inviting audiences to delight in this murder spree right alongside its sick perpetrator. Of course, it wouldn’t be an EC joint if that delight weren’t shaded by the ominous, fatalistic realization that this vigilante is courting a karmic comeuppance. 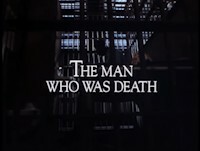 Not only is this abundantly clear, but so too are the particulars of his eventual fate, as “The Man Who Was Death” closes the loop on itself in satisfying fashion, cementing it as the perfect opening volley for a series that routinely served up similar chills and thrills. Years later, they’re still quite potent, so much so that they’re practically begging for a continuation. Recent attempts to revive the show have been scuttled by rights issues, but here’s hoping that gets sorted: like the Cryptkeeper himself, this series is too unhinged and lively to truly stay dead.